Infertility due to implantation failure explained as seed soil relationship in Ayurveda. 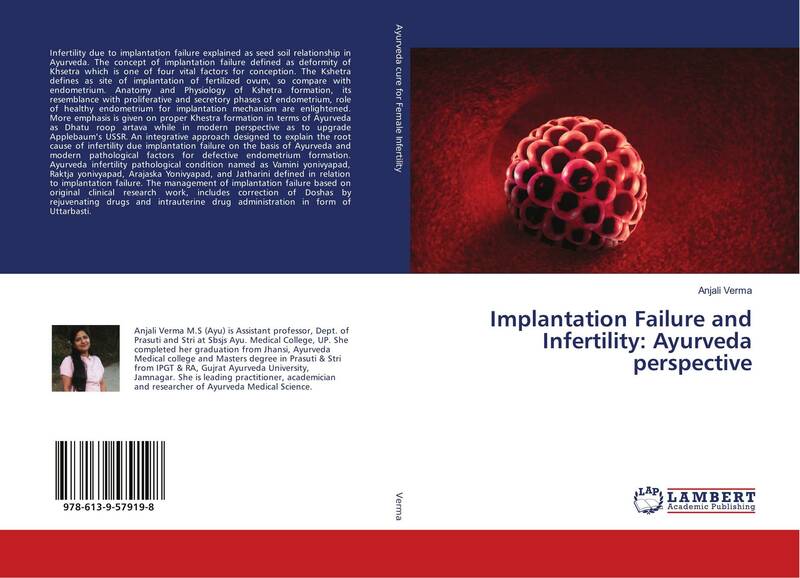 The concept of implantation failure defined as deformity of Khsetra which is one of four vital factors for conception. The Kshetra defines as site of implantation of fertilized ovum, so compare with endometrium. Anatomy and Physiology of Kshetra formation, its resemblance with proliferative and secretory phases of endometrium, role of healthy endometrium for implantation mechanism are enlightened. More emphasis is given on proper Khestra formation in terms of Ayurveda as Dhatu roop artava while in modern perspective as to upgrade Applebaum’s USSR. An integrative approach designed to explain the root cause of infertility due implantation failure on the basis of Ayurveda and modern pathological factors for defective endometrium formation. Ayurveda infertility pathological condition named as Vamini yonivyapad, Raktja yonivyapad, Arajaska Yonivyapad, and Jatharini defined in relation to implantation failure. The management of implantation failure based on original clinical research work, includes correction of Doshas by rejuvenating drugs and intrauterine drug administration in form of Uttarbasti.